^ Cooper, Tarnya, ed. “A view from St Mary Overy, Southwark, looking towards Westminster, c.1638”. Searching for Shakespeare. London: ナショナル・ポートレート・ギャラリー. pp. 92–93. ISBN 9780300116113. ^ Mulryne, J R; Shewring, Margaret (1997). Shakespeare’s Globe Rebuilt. Cambridge University Press. ISBN 0521599881. ^ Wilson, Ian (1993). Shakespeare the Evidence. London: Headline. xiii. ISBN 0747205825. ^ Nagler 1958, p. 8. ^ Encyclopædia Britannica 1998 edition. ^ Braines, William (1924). The site of the Globe Playhouse Southwark (2 ed.). London: Hodder and Stoughton. OCLC 3157657. ^ Cooper, Tarnya, ed (2006). “A view from St Mary Overy, Southwark, looking towards Westminster, c.1638”. Searching for Shakespeare. London: National Portrait Gallery. pp. 92–93. ISBN 978-0-300-11611-3. ^ Shapiro, James (2005). 1599—a year in the life of William Shakespeare. London: Faber and Faber. p. 7. ISBN 0-571-21480-0. ^ Adams, John Cranford (1961). The Globe Playhouse. Its design and equipment (2 ed.). London: John Constable. OCLC 556737149. ^ Bate, Jonathan; Rasmussen, Eric (2007). William Shakespeare Complete Works. London: Macmillan. p. 1030. ISBN 978-0-230-00350-7. ^ Dover Wilson, John (1968). The Works of Shakespeare—Julius Caesar. Cambridge New Shakespeare. Cambridge, England: Cambridge University Press. p. ix. ISBN 0-521-09482-8. ^ Stern, Tiffany (2010). “The Globe Theatre and the open-air amphitheatres”. In Sanders, Julie. Ben Jonson in Context. Cambridge, England: Cambridge University Press. p. 113. ISBN 0-521-89571-5. ^ a b Wotton, Henry (2 July 1613). “Letters of Wotton”. In Smith, Logan Pearsall. The Life and Letters of Sir Henry Wotton. Two. Oxford, England: Clarendon Press. pp. 32–33. ^ Dekker, Thomas (1609), reprinted 1907, 0-7812-7199-1. The Gull’s Hornbook: "the stage...will bring you to most perfect light... though the scarecrows in the yard hoot at you". ^ Nagler 1958, pp. 23–24. ^ Kuritz, Paul (1988). The making of theatre history. Englewood Cliffs, N.J: Prentice Hall. pp. 189–191. ISBN 0-13-547861-8. ^ from attiring—dressing: “tiring, n.3”. Oxford English Dictionary (2 ed.). Oxford, England: Oxford University Press. (1989). ^ Egan, Gabriel (2015). “Lighting”. In Wells, Stanley. The Oxford Companion to Shakespeare (2 ed.). Oxford University Press. ISBN 9780198708735. ^ Ingleby, Clement Mansfield; Toulmin Smith, Lucy; Furnival, Frederick (1909). Monro, John. ed. The Shakespere allusion-book : a collection of allusions to Shakespere from 1591 to 1700. 2. London: Chatto and Windus. p. 373. OCLC 603995070. ^ a b Gillies, John (1994). Shakespeare and the Geography of Difference. Cambridge, England: Cambridge University Press. p. 76. ISBN 9780521417198. ^ Stern, Tiffany (1997). “Was 'Totus mundus agit histrionem' ever the motto of the Globe Theatre?”. Theatre Notebook (The Society for Theatre Research) 51 (3): 121. ISSN 0040-5523. ^ Egan, Gabriel (2001). “Globe theatre”. In Dobson, Michael. The Oxford Companion to Shakespeare. Oxford, England: Oxford University Press. p. 166. ISBN 978-0-19280614-7. Bowsher, Julian; Miller, Pat (2009). 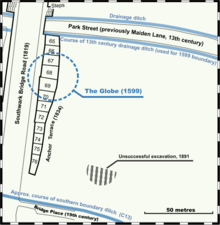 The Rose and the Globe – playhouses of Shakespeare's Bankside, Southwark. Museum of London. ISBN 978-1-901992-85-4. Egan, Gabriel (1999). “Reconstructions of The Globe: A Retrospective”. Shakespeare Survey. Shakespeare Survey 52 (1): 1–16. doi:10.1017/CCOL0521660742.001. ISBN 0-521-66074-2. http://dspace.lboro.ac.uk/dspace/bitstream/2134/469/1/Recon_S-S.pdf 2007年7月25日閲覧。. Egan, Gabriel (2004). “The 1599 Globe and its modern replica: Virtual Reality modelling of the archaeological and pictorial evidence”. Early Modern Literary Studies 13: 5.1–22. ISSN 1201-2459. http://extra.shu.ac.uk/emls/si-13/egan/index.htm 2007年7月25日閲覧。. Gurr, Andrew (1991). The Shakespearean Stage 1574–1642. Cambridge: Cambridge University Press Press. ISBN 0-521-42240-X. Mulryne, J. R; Shewring, Margaret (1997). Shakespeare's Globe Rebuilt. Cambridge University Press. ISBN 0-521-59988-1. Schoenbaum, Samuel (1991). Shakespeare's Lives. Oxford: Clarendon Press. ISBN 0-19-818618-5. A reconstruction of the second Globe The structure of the Globe by extrapolation from Hollar's sketch. University of Sydney.